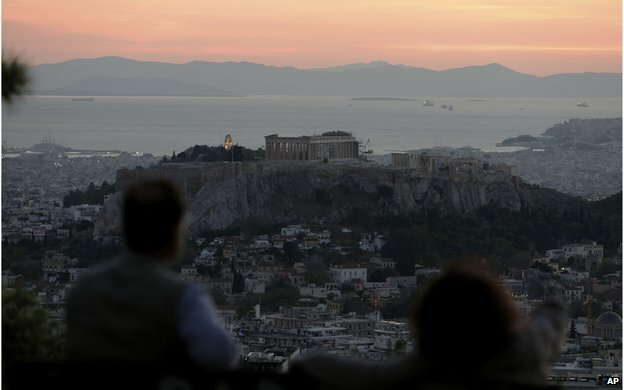 With predictions of growth in 2014 and unemployment down slightly, there is a feeling of optimism in Athens – but Greeks say they know there are still difficult days ahead. They come just before sunset – those magical few minutes in which Athens bathes in a deep purple glow. It is a light I have never seen anywhere else. I often wait for it, looking out at the late afternoon sun. It sets behind the Acropolis, where the ancient Gods were worshipped, glinting onto the Aegean nearby. Rays dance across the mountains. And then they reach the one skyscraper in the city: the Athens Tower, as it is called, poking above a skyline where nothing is allowed to stand taller than the Parthenon. The colours change – for a few seconds it seems like the building is on fire, the glass now reflecting the shot of orange that hits it square on. It is an almost spiritual moment in a city revered throughout the centuries – but now associated with darker times. And as I watch the scene today, I can hear the distant voices of protest, the megaphone shouting anti-austerity slogans: who is it this time? Doctors? University staff? You lose track. 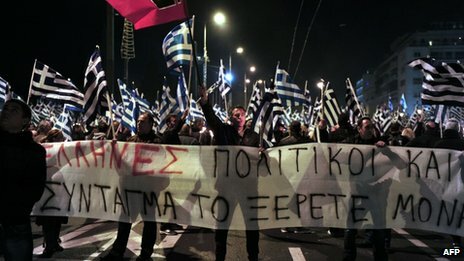 But even as the rallies continue and the exhaustion of four years of financial crisis deepens, Greece goes on. This is something that many outside fail to grasp: that even at the height of the meltdown, when petrol bombs and tear gas enveloped the main square, when parliament argued into the early hours over more cuts, when there were crisis talks in Brussels about how a country might transition out of the Euro – this one would pick itself up, dust itself off and go on living. Shops would stay open, cafes remain busy, offices work and tourists arrive. 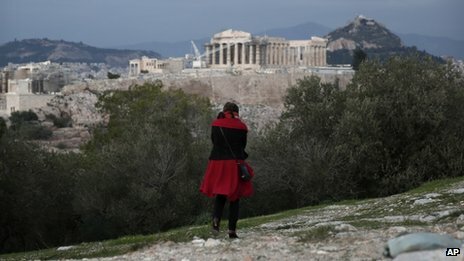 What is known is the story of Greece’s decline, how a once-confident country has lost a quarter of its economy; of 27% unemployment – double that among the youth – of pensions slashed and homelessness up. And that is all true, it has been heartbreaking to see the tearing of the social fabric. And yet perhaps the story correspondents have not told enough is about how Greece has not actually collapsed. It has made me reflect. Hospitals and schools cannot afford basic equipment, the number of suicides has risen, some people who burned wood for their heating because oil was too expensive have died of suffocation, a party that denies the Holocaust and attacks immigrants is polling 10%. Does that not constitute collapse? 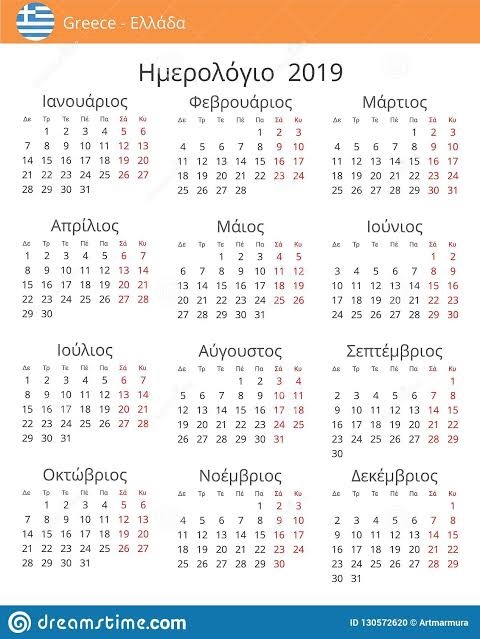 But on the other hand, Greece functions. The government has not fallen and this year the protest movement has faded. Far fewer have taken to the streets, there has been almost no violence. Why? That the opposition here is split is certainly one reason. Communists, unionists, the weary middle class and anarchists converge clumsily in demonstrations, knowing what they are fighting against but not unified in their goals. I joined students protesting this autumn who chanted the same tired slogans that have been heard here for 40 years. The importance of the family unit in Greece has shielded many. And people here love life: even if some cannot afford essentials, they still find pleasure in their climate, landscape and culture. But perhaps it is also that there is a large proportion that quietly supports what has happened. I sat in a bustling bar last week with a lawyer who is among them. The crisis is changing Greece for the better, he told me. The bloated, clientelist public sector that employed unqualified people in return for political support, is being reformed. Greeks are learning to live within their means. Tax evasion is no longer accepted. A new culture of solidarity has emerged: a feeling of “we are all in it together”. There is even a spirit of entrepreneurialism being born. It is, he said, a painful transition – but a necessary one. Psychiatrists talk of the five stages of grief: denial, anger, bargaining, depression and acceptance. Maybe Greece, which has known much grief, is edging towards the final stage. 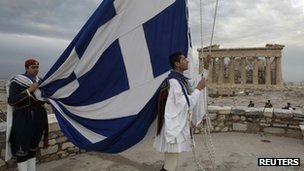 I meet far more now who tell me that if they could choose between going back to 2004, when Greece basked in the Olympics and European football victory and felt wealthy – or now, pushing on, out of all this – they would take the latter. The realisation has dawned that pre-crisis Greece was an illusion: it was a party which just had to end. For sure, this country is changing in fundamental ways. Yet visitors here always remark how “normal” it seems – that is perhaps above all, a testament to Greek resilience. Beneath the smiles, though, there is a fear of the future. The government talks of the worst being over, of an end to recession next year, of unemployment starting to fall. On paper, the figures do look better. But as another tumultuous 12 months come to a close, nobody can tell if that sunset over Athens really does mark a true glimmer of hope.